What Is The Best Type Of Fiber? Find out how fiber can help shed fat and keep you healthy for the long haul. A: Whether you count macronutrients or not, it's important to be mindful of fiber: the nondigestible form of carbohydrates. Fiber is either soluble or insoluble, and both types can improve heart health and longevity and increase satiety. "Soluble fiber dissolves in water into a gel-like material," says Tom Holland, C.S.C.S. "Fiber, especially soluble fiber, can slow the absorption of sugar in our bodies, which may delay hunger, assist in weight maintenance, prevent type-2 diabetes, and help those who are diabetic." Holland says oatmeal, apples, blueberries, carrots, and celery contain soluble fiber, while insoluble fiber is found in brown rice, broccoli, and leafy vegetables. "Insoluble fiber passes almost intact through the gastrointestinal system," says Holland. "It helps prevent constipation by adding bulk to stool and speeding up the rate at which food passes through intestines." So how much fiber do we need? In 2002, the Institute of Medicine published a report suggesting men and women under the age of 50 consume 38 to 25 grams of fiber per day respectively. Hitting these numbers can add years to your life and keep inches off your waist. According to new meta-analysis of 25 studies in The North American Journal of Medicine and Science, people who ate the most fiber had a 23% lower all-cause mortality rate compared with those who ate the least fiber. Eight studies in a 2014 American Journal of Epidemiology analysis showed a 10% lower risk of mortality with each 10-gram daily increase in fiber intake. And for heart health, an extra 7 grams of fiber a day lowers risk of cardiovascular disease by 9% according to a 2012 BMJ study. "To put these numbers in perspective, an apple has 3 grams of fiber, 1/2 cup of green peas has about 9 grams, and one cup of black beans has almost 20 grams," says Holland. Fiber's role in weight loss is played out meal by meal. Recent research suggests pectin and other soluble fibers show the most significant appetite-reducing effects during the day of consumption, so you may want to place these types of fibrous foods high on your grocery list. "Fiber-rich foods require more chewing, decreasing the likelihood of overeating by giving the body time to register the feeling of fullness," says Holland. 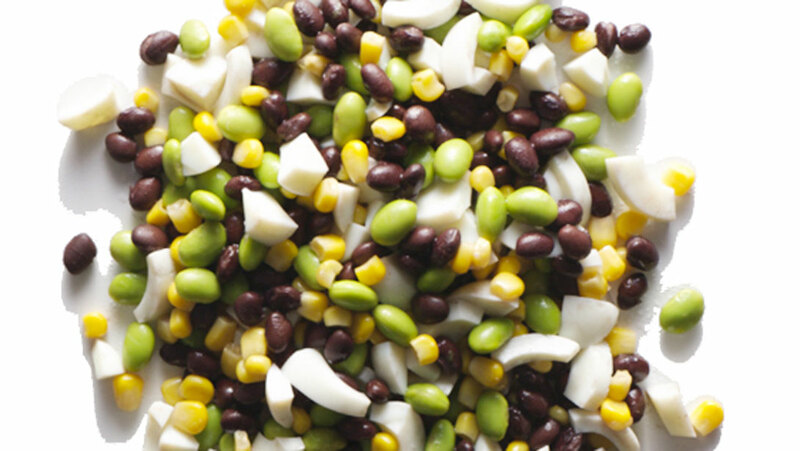 Toss ingredients in a bowl and use a dressing of your choice.